You all know that feeling. You had a long, exhausting day and now you’re looking forward to sinking into the couch, eating a proper dinner. Usually the couch is totally ready for y0u, while the food is still laying in your fridge – unprepared of course. This is what I had last week. Tired and hungry and not at all all in the mood to turn on the stove. 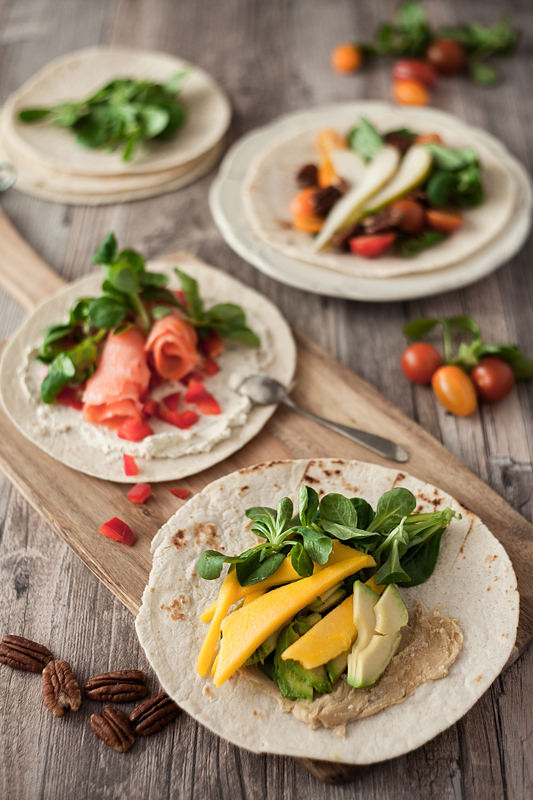 For such occasion wraps were invented. 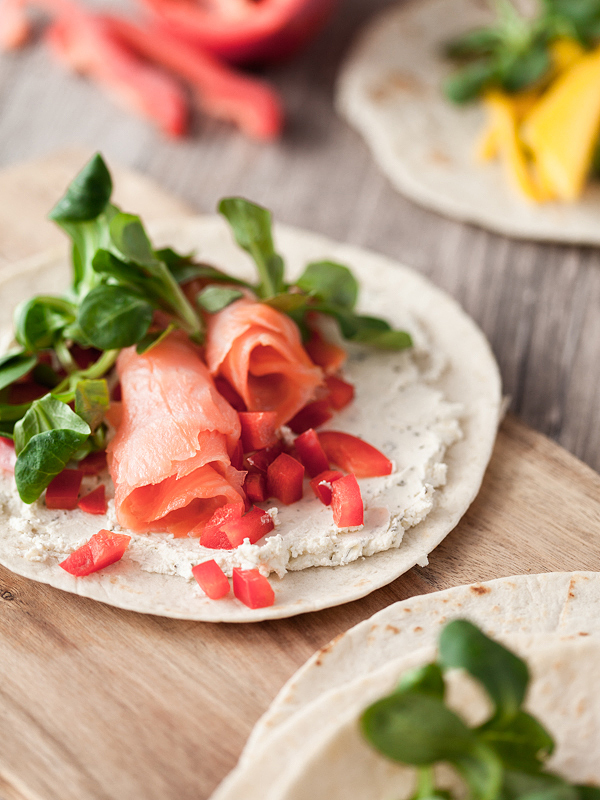 Quick to prepare, delicious and ideally healthy wraps. That day last week some awesome combinations came to my mind, which I had fully prepared only 20 minutes later. I COULD have just let myself fall down onto the couch and not move an inch for the coming hours. I COULD – if there weren’t this little, negligible given fact that I am a food photographer with an aesthetics mania. Naturally I couldn’t withhold this spontaneous outpouring of creativity and deliciousness. What kind of a blogger would I be if did so? Consequently I fetched my photo surfaces, collected some food props and prepared my camera. Luckily I have a very big window front and the weather was adequate so my flash eqipment could stay in the bag. Just one hour later I had all the necessary photos taken and could finally bite into my “quick” and healthy wraps. No more restraints. I was finished after only five minutes. Sometimes a food photographer does have a rough ride. The first combination is outshone by two of my most favourite foods ever. Avocados hold a fundamental part in my kitchen. I basically have them at home at any time, unless my trader of choice doesn’t have them in stock, which happens almost never. A little tip to store avocados: I usually buy them at different degrees of ripeness: 1-2 very soft one’s that I can eat in the next 2-3 days and some avocados that are still solid and can ripen at room temperature and are stored in the fridge later to stay fresh even longer. Mangos, on the other side, I handle completely different. I only buy them when they’re already ripe and soft and juicy. Firstly it’s much cheaper the ‘soon to be expired mangos’, secondly I’m so absolutely incapable of catching the right moment, that little time frame between the mango being rock-hard and it being soft, mushy and brown. It’s just impossible for me. This is why I buy them ready-to-eat and utilise them within 1 day tops. 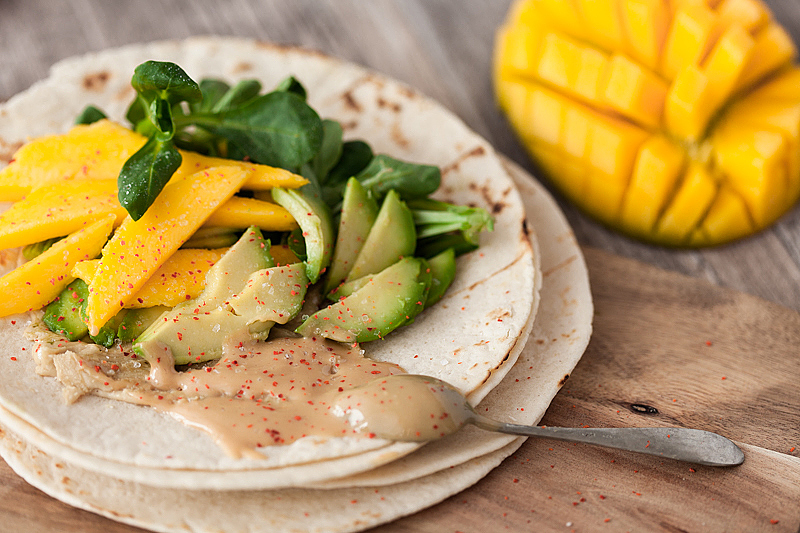 The combination of mango and avocado might seem uncommon at first sight, but it’s brilliant, trust me. The avocado gives the soft and creamy flavour while the mango contributes fruitiness and sourness. The whole combination is topped off with a scoop of cashew butter (learn here how to make your own cashew butter), which is creamy and sweet. The mache serves as a fresh base (here’s another great mache recipe). You just have to add some salt and chili flakes and there’s nothing else you’ll need. I reduced my consummation of meat quite a lot already, since I live and cook for myself. But there’s one thing that ends up in my shopping cart on every seconds grocery trip. I need smoked salmon in my life, there’s no way around. Usually I eat it on toast with avocado or in my sushi with scallions and fresh cheese. Of course it couldn’t be missing in my healthy wraps. The classic combo with fresh cheese and red peppers is so fantastic, fresh and satisfying. 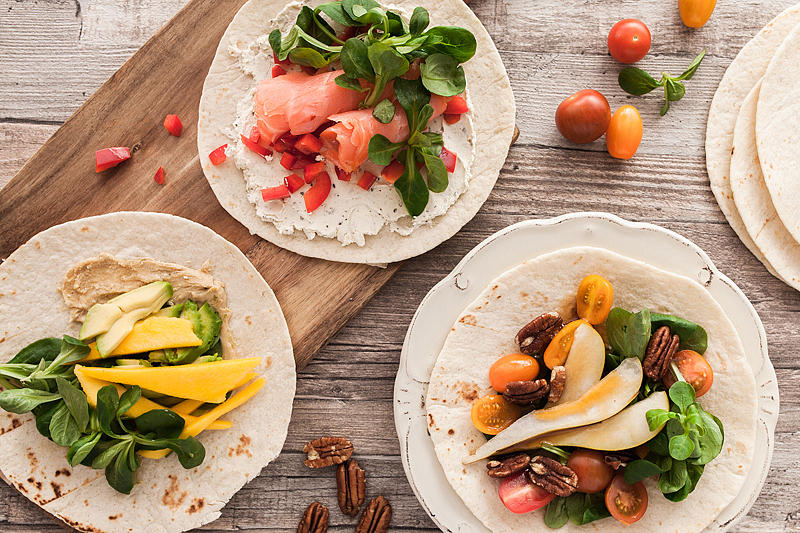 If you don’t happen to have wraps around, feel free to put it on your toast for breakfast. After having lived in Canada for 10 months, I can’t imagine my fridge with at least one small, sticky glass bottle filled with sweet and vicious maple syrup. Its variety is so amazing and you can use it for both, sweet and savory meals. It’s by the way also a nice substitute for refined sugar and extremely tasty combined with mustard, oil and vinegar as a salad dressing. For those healthy wraps however I just poured it over the pears. Please don’t exaggerate as much as I did. 1-2 teaspoons will suffice, or your mouth will stick together from all that sweetness. Another great example of the burdens a food photographer has to carry. If one wants to shoot a pouring motion, it’ll get dirty. Wash and cut the ingredients. 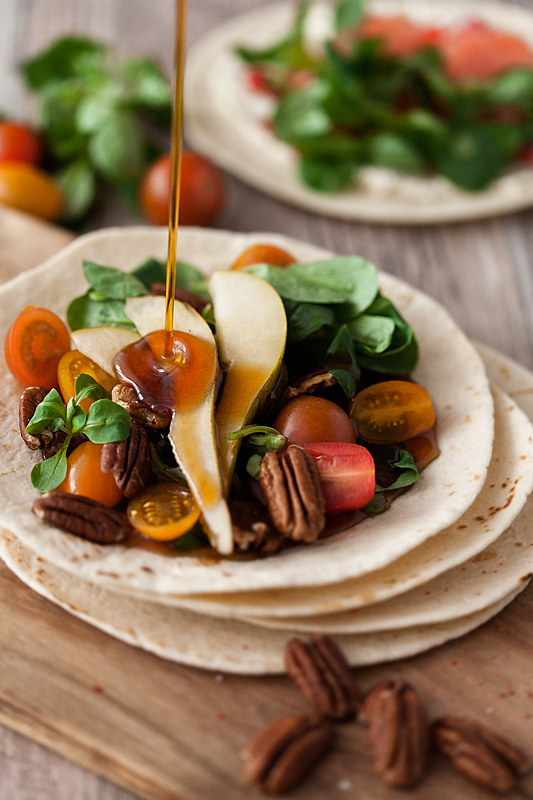 Spread the cashew butter / fresh cheese / maple syrup evenly on your wrap and add the other ingredients. Why are you still reading? That's all.